Q: In the beginning, why did Lucas's brother Jeff (the kids father) panic and try to kill his own kids? Another South American director has made his splash on Hollywood after the successful debut of Mama in theaters this year. Argentinean director, Andres Muschietti, made over 70 million dollars in the box office and received decent reviews for this horror/suspense film based on a short 3 minute movie he directed in 2008. That short film garnered the attention of movie executives such as Guillermo Del Toro who decided to produce and present this film. The fact that Del Toro's name was used here and that the coveted Jessica Chastain signed on to play the main character gave Muschietti the tremendous possibility of debuting on a high note. The formula worked pretty well because critics and audiences seemed to enjoy this film alike, and we could be heading to the start of a new horror franchise. 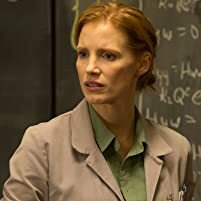 I enjoyed most of the movie, and loved Jessica Chastain's performance, but the ending just ruined the entire film for me. It is kind of the same problem pretty much every ghost story film has. I feel like most of the endings in this genre are pretty unsatisfying and ruin the entire suspense the film has been building throughout the story. There is no denying that Japanese films have heavily influenced the genre with films such as The Ring, The Grudge, Dark Water, and One Missed Call which have all been remade, but the truth of the matter is the only film that really worked with critics was The Ring. They have tried to imitate its success, but I haven't been scared like I was with The Ring, which had a pretty satisfying ending compared to the rest. I do prefer this type of psychological horror more than the gory slasher films, but I find it troubling that they can't find a satisfying ending. My favorites in this genre will always be the first two I saw: Zemeckis's What Lies Beneath and The Ring. The rest have all fallen short. Mama was close to achieving that similar success in my opinion, but the ending really hurt it. The film centers around two girls named Lilly (Isabelle Nelisse) and Victoria (Megan Charpentier) who are abandoned in a cabin in the middle of the woods after their father murdered their mother and was attacked by some presence inside the cabin. Five years later the search finally pays off and their Uncle Lucas (Nikolaj Coaster-Waldau) finds them. To everyone's surprise the two girls have managed to survive on their own, but they live like animals crawling around the floor and talking to walls. Lucas and his girlfriend, Annabel (Jessica Chastain) decide to raise the kids with the help of Dr. Dreyfuss (Daniel Kash) who continues to treat the girls in order for them to make the transition from their isolated lives to a normal and nurturing family life. Annabel soon discovers that these girls might have never been on their own and that somehow the presence that was with them in the cabin might be in their home as well. Several suspenseful and horrifying events begin to take place while the girls continue to talk to shadows in the walls and call out for Mama. The film has several thrills and suspenseful moments with a great performance from Jessica Chastain. It was good to see her try out a different role and she proves she can do about everything. It's hard to find good performances in horror films, but this may be one of the best. The movie also has its weaknesses like pretty much all horror films do considering the protagonists always seem to make stupid decisions, but that is what makes the genre so entertaining at times. They are clichés which we have learned to accept. The two girls were also surprisingly good, they had strong performances as well. I really enjoyed everything about the movie up to the last 15 minutes which pretty much ruined everything. 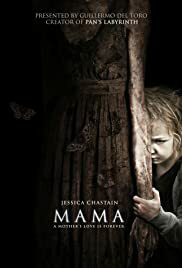 Psychological thrillers usually have this impact: they begin with a lot of promise but end up on the wrong note, and that is exactly how I felt about Mama along with Sinister, a similar movie I got to see a few months ago. The film is above average thanks to Jessica Chastain, and Guillermo Del Toro's influence in the production of the movie, but that is about it.